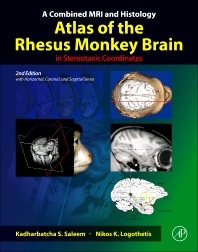 A Combined MRI and Histology Atlas of the Rhesus Monkey Brain in Stereotaxic Coordinates, Second Edition maps the detailed architectonic subdivisions of the cortical and subcortical areas in the macaque monkey brain using high-resolution magnetic resonance (MR) images and the corresponding histology sections in the same animal. This edition of the atlas is unlike anything else available as it includes the detailed cyto- and chemoarchitectonic delineations of the brain areas in all three planes of sections (horizontal, coronal, and sagittal) that are derived from the same animal. This is a significant progress because in functional imaging studies, such as fMRI, both the horizontal and sagittal planes of sections are often the preferred planes given that multiple functionally active regions can be visualized simultaneously in a single horizontal or sagittal section. This combined MRI and histology atlas is designed to provide an easy-to-use reference for anatomical and physiological studies in macaque monkeys, and in functional-imaging studies in human and non-human primates using fMRI and PET.